أ ُ خذت قياسات المنتج باستخدام المقاس الرجالي من 42 (حسب مقاسات الولايات المتحدة 8 – 8.5) ، العرض M. يرجى ملاحظة أن القياسات قد تتباين بحسب المقاس ". I've been a very happy user of the ECCO Track II for about a decade and have gone through several pairs, as the soles are not repairable afaik. They have been reliable shoes, not cheap, but waterproof and very comfortable. I also use the boot version for nature travel, again very satisfactory. The latest example that I bought is cut more skimpily in the forefoot, so the inside of the foot and the big toe get pushed in and become painful after an hours walking. The shoes look about the same, but they no longer fit nearly as well. Very disappointing that ECCO management does not appreciate the value of maintaining a consistently reliable product. Return process was flawless, refund was immediate, so I don't want to complain too much. But something wasn't right. When I took the shoes out of the box the right insole fell right out. That was my first clue. I've worn Ecco shoes for decades and that sort of lack of quality just doesn't happen. Then when I wore them the first time I could hear myself hitting the ground on every step. 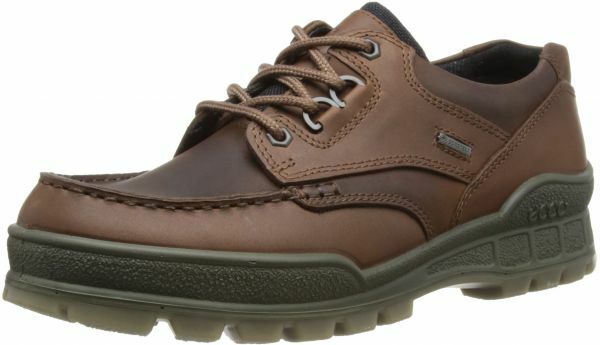 Ecco shoes have that soft rubber sole that gives almost perfect traction and doesn't make a sound and I am naturally a quiet walker. Suddenly I've got a pair of shoes with a hard sole that clicks when I walk? I don't know what the deal was. Whether these were counterfeit Eccos or they were real Eccos that had been stored somewhere where they dried out and lost their original quality or Ecco has stopped making good shoes, I don't know. I bought this pair of shoes because I had a much older pair that had worn out. I purchased these the exact model, and size including width as the one's I have and these are way too small. Unfortunately I let the window to return them go by so my bad. Be careful if you buy Ecco shoes, they must have changed their pattern. You might want to order a size smaller than you think. I wear size 10.5 in Asics running shoes. I ordered size 43 EU (9 - 9.5 US) based on some research I did beforehand. Good thing I didn't order 44 EU (10 - 10.5 US). There is still about 1/2 to 3/4 inch remaining in the toe box and my toes don't feel compressed at all. I don't know what would happen if I were to exchange them for an even smaller size. I don't want to go through the hassle, plus the 43 is fine and comfortable. First impression, the shoes are beautiful and well made. The label under the tongue says "Made in Slovakia". I am a tad OCD and the shoes pass my personal quality control inspection. I noticed some differences though between the pictures and what I received. The GORE-TEX logo on the side is slightly different and does not have the stitching that goes around the logo; the leather insoles are slightly different; and the "ecco" underneath the shoe is not black. All minor aesthetic differences that most people would not even notice. I surmise that those changes are newer updates to the shoe, or perhaps an older variation, or depends on where they are made. Regardless, the functioning of the shoe has not been compromised in my opinion. Lastly, I was wondering if there was a difference between Bison/Bison vs. Bison. From what I gather, there is no difference. I ordered and received the Bison/Bison (Style 001944, Color 00741). To my surprise and delight, they look like the Bison version which is also sold on Amazon, i.e., darker looking color and darker laces. Depending on the lighting, the color of the shoes and the laces appear different. So, enjoy and if you can find your size at a good price, then jump on it. My favorite shoes! You get what you pay for. Comfort, dryness, long wear life. Other than the expense, I can't recommend these shoes enough. In this case, you get what you pay for. I have these in brown and black (Black seems more rare). They are without a doubt my favorite shoes. I've worn them on some days walking up to 10 miles according to my fitness tracker. They are very comfortable. Also they have Gore Tex which means your feet don't get wet. I find myself at times walking back through wet puddles and snow and having this is a bonus. Over time, they haven't worn down and remain comfortable. My feet also do not sweat in these. I've got them paired with a wool blend microfiber sock. I am a 9.5 to 10 and the Euro 43 size fit perfectly. 44 size has a little extra length in the toe but also comfortable but for my feet the 43 is better. Highly recommend. My favorite shoe!